The documentary, “Coming Home: The True Story of an EOD Technician,” is not a one-man story. It is not just about that day in July 2009 when Marine Jesse Cottle stepped on a pressure plate while on foot patrol in Afghanistan. 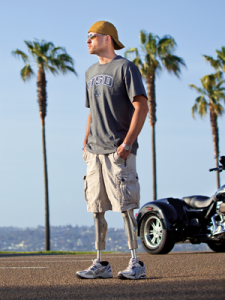 It is about the first moments, weeks and months after he lost both his legs to an improvised explosive device. It is also about his recovery and success. Directed by Colorado film student and Cottle’s longtime friend Aaron Pendergast, the film was shown on March 23 in USD’s Joan B. Kroc Institute for Peace & Justice Theatre. Co-sponsored by the USD Student Veteran Organization (SVO), the screening included a post-film discussion with Cottle and Pendergast. The documentary focuses on July 19, 2009, when the Explosive Ordinance Disposal (EOD) technician and his team were on foot patrol in Afghanistan’s Nowzad Province. It includes interviews with Cottle, his family and friends, as well as powerful on-the-ground footage of Cottle, a staff sergeant, team leader Gunnery Sgt. Kevin Brown, hospital corpsman Woody Ender and Staff Sgt. Patrick Hilty, all of it captured that day. More than 45,000 U.S. military service members have been wounded in Iraq and Afghanistan since the wars began. About 200 veterans are enrolled in USD’s undergraduate- and graduate-degree programs, says Scott Handley, advisor to the SVO. “They’re all coming back with very unique and specific needs,” says Handley, who served in the U.S. Navy from 1996 to 2002 as a hospital corpsman. The idea for USD’s SVO was born in 2008 as more wounded veterans returned home from war and the federal government increased benefits for veterans seeking college degrees. It was officially established in September 2011 and has about 50 active members. Handley and the SVO are in discussions with the administration to establish a permanent on-campus Veterans Center this summer, which he hopes will bring more visibility. Currently, it’s likely that fellow students may not even realize some of their classmates are recipients of medals like the Purple Heart, the Bronze Star and the Silver Star. “I don’t think the USD community really knows they’re here, and they’re not going to say, ‘Look at me. I’m a hero,’” Handley says. Showing the documentary is a creative way to give these veterans more of the attention they deserve. Cottle has fielded inquiries from professors who missed the screening,but who want to see the film. Handley says the SVO hopes to show it again later this year. “I really do think this helps people learn about us, the realities of war and what we’re really like,” says SVO President Travis Weger, a senior communications major who served eight years in the U.S. Navy. Cottle enlisted in the U.S. Marines in 2003, partly spurred by the 9/11 terrorist attacks. His father was a Marine in the Vietnam War. His maternal grandfather served in the U.S. Army during World War II. Cottle served three tours in Iraq as a field operator before he was deployed to Afghanistan as an EOD technician. Less than three years after the explosion, he walks with prosthetics. A biology major, he’s on track to graduate in 2014. Already a certified medical assistant, he’s considering physician’s assistant school after USD. He and his fiancee, Kelly Forrester, will marry in August 2012. Even with all that under his belt, Cottle still sometimes has to convince himself to try new things. “Maybe the longest lasting battle is the fear that I can’t do something I want to do,” Cottle said during the post-film discussion. He described relying on his wheelchair during his first year navigating USD’s hilly campus. He talked about the thrill of horseback riding in Arizona with his fiancee and future sister-in-law, after initially dismissing the idea for fear of what could go wrong. His faith and the support of his family and friends have helped him stay positive and succeed.